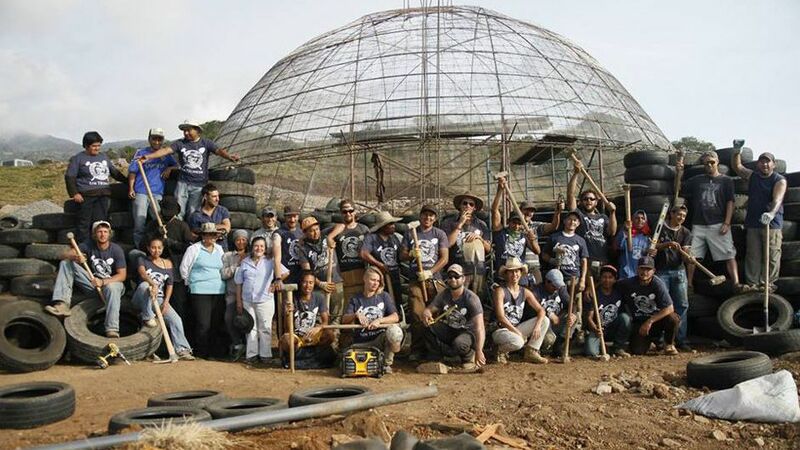 Sustainable building team, Choachi, Colombia. Photo: Long Way Home. Recently, I spent a week with Los Técnicos building an off-the-grid, sustainable home consisting primarily of recycled materials such as tires, bottles, and plastic. When these babies are built by a competent group like this Guatemalan based organization, they are gorgeous and will produce all of the energy and organic food you need. This one, in Choachi, Colombia, will serve as an animal refuge and an example of how sustainable building and living can work. I went, not only because this kind of living appeals to me, but because I believed there might be a connection between health and being a part of an Earth friendly movement. 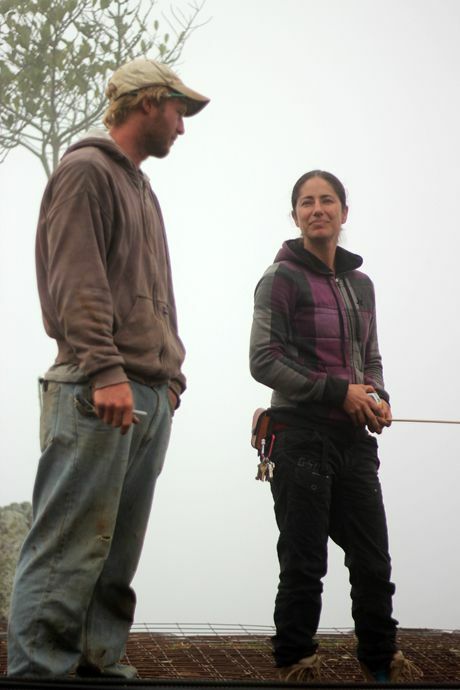 Alex, the Colombian documentarian/owner of the site with Bryan, the construction supervisor. Photo: Joe Molinari. I was quickly impressed upon joining this crew of Guatemalans, Colombians and volunteers from all over the globe. Los Técnicos has an interesting story of its own. The organization is a for profit organization that supports the associated non-profit, Long Way Home. 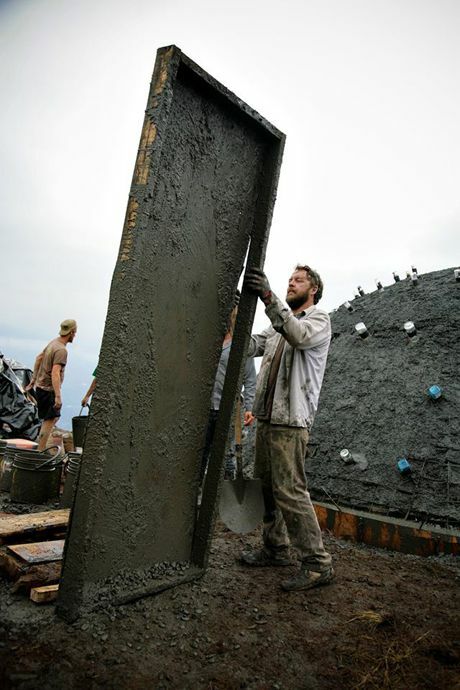 The ultimate vision, according to Long Way Home director Mateo Paneitz, is to “support people in creating decent homes, cisterns, water harvesting systems, large water tanks, compost latrines, retaining walls…”. I was particularly interested in the definite vision of empowerment. This organization is not giving or doing for people. Instead, they are supporting a future through education, apprenticeship, and job creation. These are not missionaries. They are attacking poverty through the use of a business model that draws from ancient methods of teaching, side-by-side observation and participation for learning. I know, I know, it’s crazy. Long Way Home’s mentorship starts in a school that is both active and in development. The organization believes in providing these mentorship opportunities at an early age along with science, history, and the subjects one would normally find. The school’s physical structure acts as a consistent learning experience as this is a sustainable building that continues to grow today alone with the interest and support of the community. This is where the vast majority of Los Técnicos profits go towards. The economic dream is that Los Técnicos becomes a business for Guatemalan tradesmen while foreign partners have less and less of a leadership role. People involved have the opportunity to create something for themselves hand-in-hand with a sincere partner. As a fellow believer in human potential, I was enamoured with the respect for individual and community power. “They earned it, they just needed a chance… they deserve not to be sick,” Mateo said while reflecting on the changes Guatemalan builders have made in their lives. He continued, “Look at these guys. I’ve known each of them at different stages of their lives. There is a wellness that comes with having purpose and having earned respect.” I believe him. As a fellow believer in human potential, I was enamoured with the respect for individual and community power. I had the opportunity to work with a few of the Guatemalans who have been with the programme for years. When I asked simple questions about the project, philosophy and life of this process, I was answered with stories of pride… pride in how families were now healthy and with greater opportunities and pride in the sense of accomplishment and mastery of a trade that can be highly technical. I was impressed with the motivation and strength this group had. Guatemala has a special place in my heart and they filled that spot with hope. Mateo working on site. Photo: Long Way Home. Local Colombians who were new to the process and organization seemed interested in what future this project might provide for them. Willy, an especially kind and helpful man (toured me around town on my last day), told me of his respect of the use of waste material and his hope for new skills that will forward his own career in building. The site was an example for Colombians to see a unique idea that is completely feasible for local use. People travelled from all over the area to tour the site and speak with workers. International volunteers, including me, were there for various reasons and many working through their own journeys. One particularly inspiring traveler was Jeremy, a former oil worker with a strong heart, and recently, a man who is beating the heck out of the diminishing power of drugs. Jeremy had been invited by Mateo to participate in the Los Rocas project after a close brush with death. A month later he was on a plane for his first trip outside of North America and has found that being in the mountains, working for a cause that helps the Earth and community and building something greater than oneself with a supportive community has an incredible amount to do with his personal healing journey. This guy is now sharing his story with anyone who will listen and is an absolute inspiration to me. So, all of this gets me thinking. I’ve never had absolute beliefs about anything spiritual, though I do know that I feel deeply connected to the Earth and life around me. I’m also well aware of the sickness the Earth is incurring and the consistent growth of pollution and trash that is destroying land, wildlife, and the potential to live on this Earth healthily. What if we can heal together? It is certainly possible and is happening in this project and others that I’ve seen. Maybe it’s time we think of this more as a way of life. My week in Choachi left me inspired, motivated, grateful, and hopeful about the future. Wouldn’t it be lovely to have that in communities of people on a regular basis? I believe that Mateo is right on in connecting wellness to sustainability. For one, the idea of creating something for yourself is powerful. When we feel and see success, we have space to be with ourselves in an accomplished and strong place. The smiles, handshakes, and recollections with our friends are rituals that keep the satisfaction flowing. This is the opposite of what people call depression. Secondly, being part of a project in sustainability is to be a part of a movement. It is a revolution against the norms of poisoning the Earth that we have grown so accustomed to. It feels good to be a part of something so positive, to know that everyone around you believes in a better world and is taking action to make this reality. This is the opposite of what we call a hopeless community. Finally, our wellness is connected to the Earth and its health. I feel better with more sun, clean air, and places in which to be active. In taking care of each other, the planet and I build a mutually beneficial relationship. This is the opposite of a troubled relationship. Long Way Home’s school in Guatemala. Photo: Long Way Home. One week with Los Técnicos left me so inspired that I am absolutely committed to co-building a sustainable community with people I care about. I built solid relationships with people I can’t wait to speak with again, got ideas of the future buzzing in my head and generally had a blast. If you want to visit this project or another one they have going on, I highly suggest you check them out. You will be welcomed by some of the best people on earth in the incredible Colombian mountains — and you will quickly learn how possible this way of life really is. This story, which originally appeared on Go to Be Found, is reproduced here with permission. Sustainable Wellness: A Road to Loving the Earth and Ourselves by Joe Molinari is licensed under a Creative Commons Attribution-NonCommercial-ShareAlike 4.0 International License. Permissions beyond the scope of this license may be available at Go to Be Found. Joe Molinari is a licensed clinical social worker, psychotherapist, and avid explorer who believes in the inherent power within people and communities to create the future they want for themselves. He is dedicated to expanding the ways in which we understand healing in respectful and culturally appropriate ways. Joe grew up in Virginia, USA, though has more recently called Arizona home while working with Native American tribes.